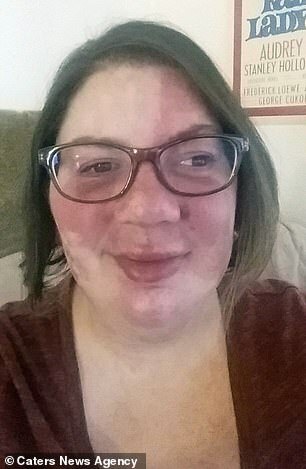 A woman born with a port wine stain that covers her face is shunning treatment after learning to love her ‘gecko-like’ appearance. 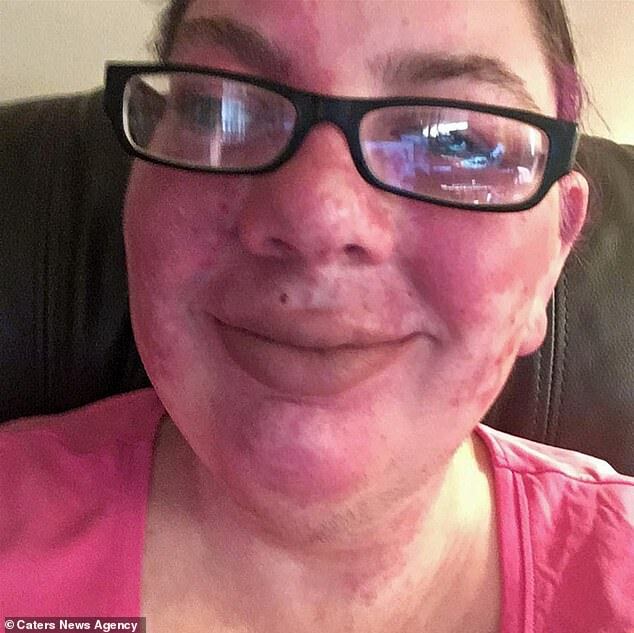 Shannon Stoner, 35, from McMinnville, Tennessee, suffers from birthmarks that cover around 80 per cent of her body. She was born with Sturge-Weber syndrome, which causes abnormal blood vessels to develop in the skin, which causes the birthmarks. Growing up, children would cruelly call her ‘gecko’ and say she had ‘Kool Aid on her face’. 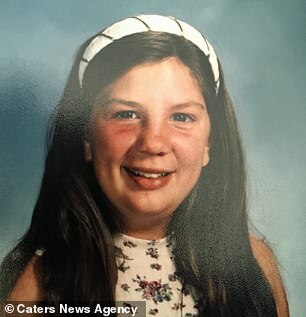 Ms Stoner started laser treatment to stop her birth-marked skin thickening at just 12 years old. However, after enduring 15 sessions, she is keen to keep the therapy to a minimum because she does not like how it reduces her blemishes. 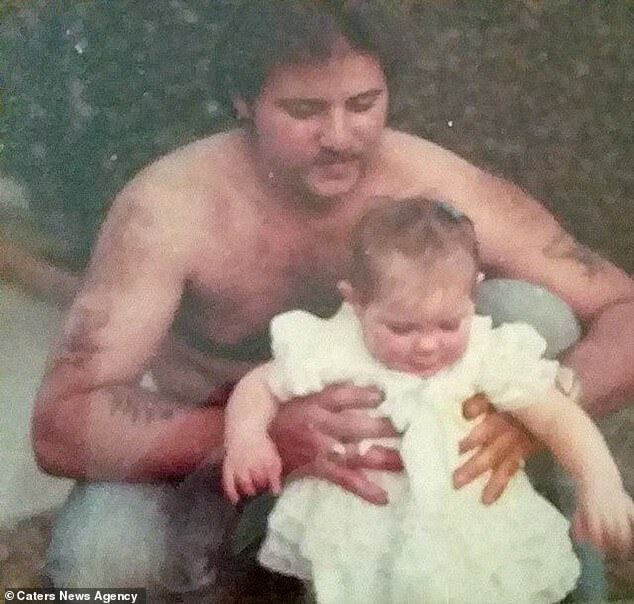 At just two months old, doctors initially worried Ms Stoner was bruised while she was treated in hospital for pneumonia. After the police were nearly called, Ms Stoner’s paediatrician explained her birthmarks were normal and not a sign of abuse. Although Ms Stoner’s family encouraged her to embrace her appearance, cruel comments from strangers wore her down. ‘A cashier once looked at me and said, “shame your mum couldn’t have washed the Kool Aid off your face”, my mum told her, “you know it’s a birthmark, right?”,’ she said. Although the bullying continued as Ms Stoner grew up, she believes it made her stronger. ‘In my teen years I felt differently but I grew mentally,’ she said. ‘There are so many things that are much worse than a birthmark. ‘When I worked in retail I would deal with a lot of kids, they believed it was a rash as they had gone through rashes before, their parents seemed to be the most disturbed by it. 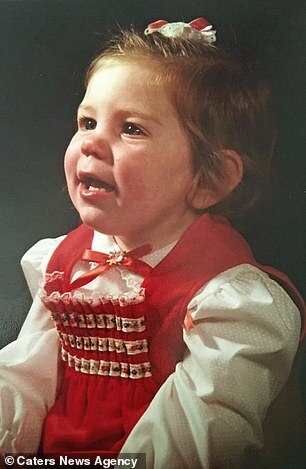 Despite the setbacks, Ms Stoner – whose birthmarks appear darker on some days than others – worked hard to embrace her uniqueness. 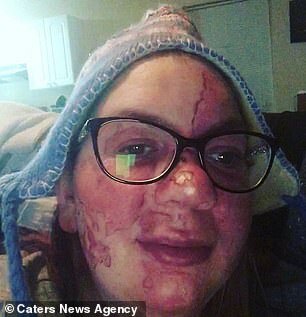 Speaking of her blemishes, she said: ‘It reminds me of a barbed-wire tattoo on my one arm, then my leg it looks like cheetah spots, and it kind of reminds of a map of Africa and Australia, and covers the entire left side of my face. She claims her friends and family are almost oblivious to her appearance now. But Ms Stoner – who works at a church – added one child continually asked her why she ‘looks so weird’. 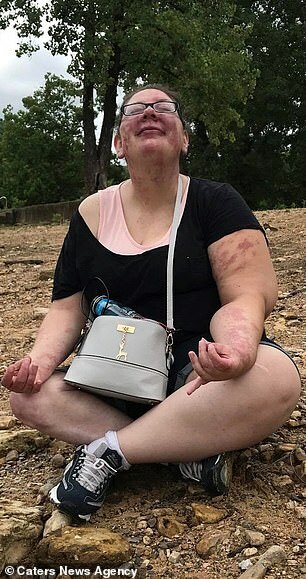 Although she has had laser treatment to stop her skin thickening, Ms Stoner wants to keep the therapy to a minimum because she does not like how it changes her appearance. 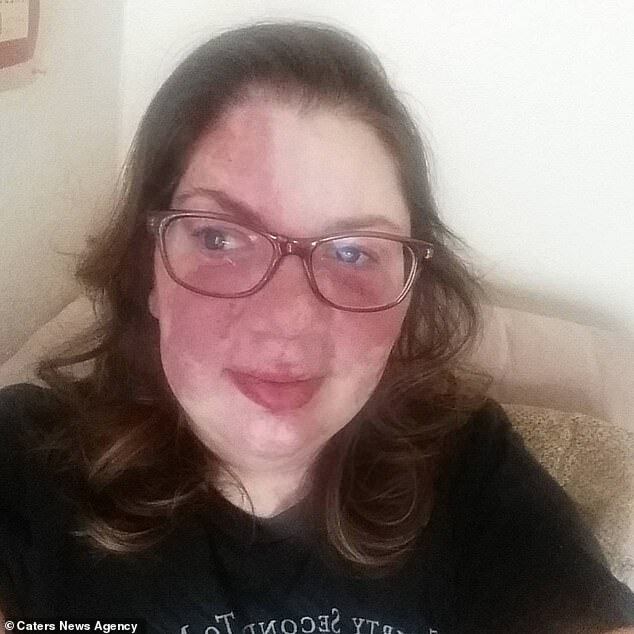 ‘If I could I would keep as much of my birthmark as possible because it’s such a huge part of who I am,’ she said. ‘I would be a different person completely if I wasn’t gifted with my birthmark and all that comes with it. 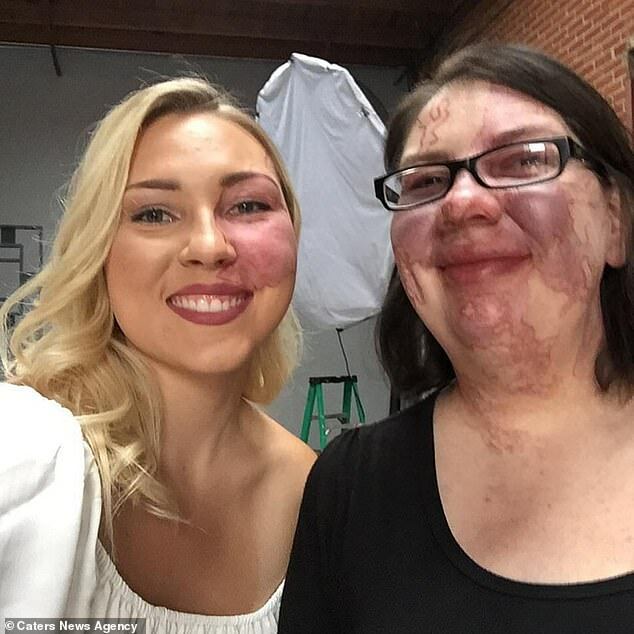 ‘If I wanted to cover it up I could, but I don’t want to use make-up, I like living my life this way, it’s a birthmark not something horrible. Ms Stoner is still undergoing treatment to remove granulomas – a small area of inflammation, which can affect organ function. ‘I want to show people what I go through on a day-to-day basis,’ she said. 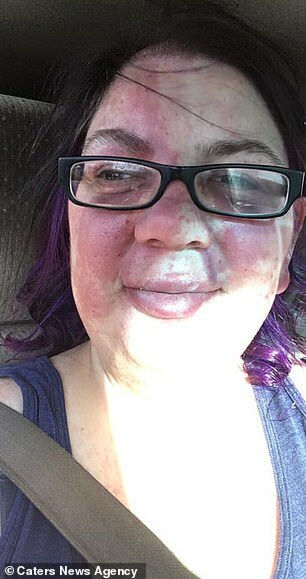 ‘There are so many people with birthmarks and it’s way easier to connect now than when I was a kid, you don’t feel as alone anymore. A port wine stain is a birthmark caused by the overdevelopment of blood vessels underneath the skin. The change in the blood vessels is caused by a genetic mutation which occurs before a child is born, and will remain for the rest of a person’s life – though the severity of them differs between people. Port wine stains begin as a flat red or purple mark and, over time, can become more raised, bulkier and darker in colour. They can occur anywhere on the body but 65 per cent of them appear on a person’s head or neck. Around three in every 1,000 babies has a port wine stain and they are more common in girls than in boys, though the reason for this is not known. Treatment usually involves laser treatment to remove some of the dark colour from the mark, or camouflaging the discolouring using a special type of make-up.